The market for grass fed beef is growing quickly, and the future looks promising. A few days later, the owner of the locker called back and said he thought the meat would grade low choice. “I said it can’t grade low choice,” says Wood. “I just didn’t believe it.” To check it out, Wood and a few friends fired up the grill and, just for comparison, cooked one of those steaks along with a prime Hereford steak. All three agreed: “The grass-fed beef tasted better. It was sharper, cleaner, just a really novel flavor,” says Wood. Today, Wood and his friends ship grass-fed beef—and lamb and pork and several other meats—from U.S. Wellness Meats in Canton, Missouri (grasslandbeef.com). The company ships product to all 50 states and is quite possibly the largest internet retailer of grass-fed meats. It still is easy to say “grass-fed beef” to a group of traditional cattlemen and get a good laugh. All beef is fed grass earlier in life, but beef finished on grass? It’s tough, chewy, and tasteless, right? Not necessarily, as a growing number of cattlemen are proving. Grass-fed beef might only be 5 percent of the beef market—that’s an estimate because the trend is difficult to track—but the market is estimated to be growing 100 percent per year. Steaks from a well-managed, grass-fed beef farm can be marbled, juicy, and tender…if the cattle grazed on something more than fescue. In other words, if they ate intensely managed, high quality forages. 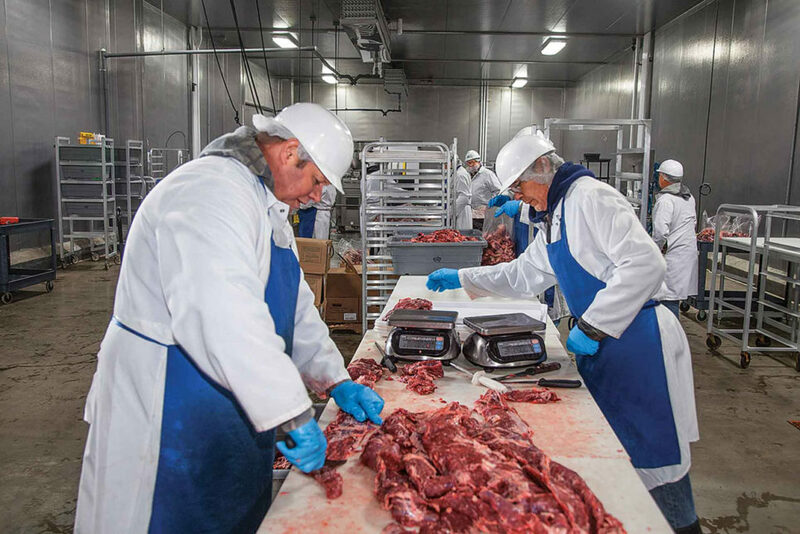 Butchers at U.S. Wellness Meats prepare meat for packaging. Grass-fed beef has several qualities that are of great interest to certain buyers, but all eyes are on one group in particular—the millennials, people roughly in their early 20s to mid-30s. Yes, they want to know how the cattle are treated—despite the fact that those cattle will eventually find themselves on the slaughtering floor. These consumers want to know their meat comes from an animal that spent plenty of time in the fresh air, on clean, dry pastures. They don’t want the cattle in crowded feedlots, eating something they weren’t meant to eat (grain), given antibiotics and growth hormones, and standing in mud. The price premiums of grass-fed beef can vary widely. Because he sells in such great quantities, Wood’s prices at U.S. Wellness are just a bit more than conventional beef. Stone Barn’s report says the premium can be more than 70 percent at the retail level. Several people are watching the trend to grass-fed beef, but few with as much attention as Jason Rowntree, associate professor of animal science at Michigan State University. He and his crew have about 500 Red Angus cattle on two farms in northern Michigan, and since 2010 they have focused on the production and quality of beef from grass-fed cattle. “I really do believe this industry is going to continue to grow,” he says, adding that grass-fed isn’t in competition with corn-fed beef. There’s plenty of room for both. But he also sees advantages for grass-fed beef. One critical advantage? As interest among today’s local-food consumers grows, providing foods like grass-fed beef is a way for farmers to better connect with their urban customers. 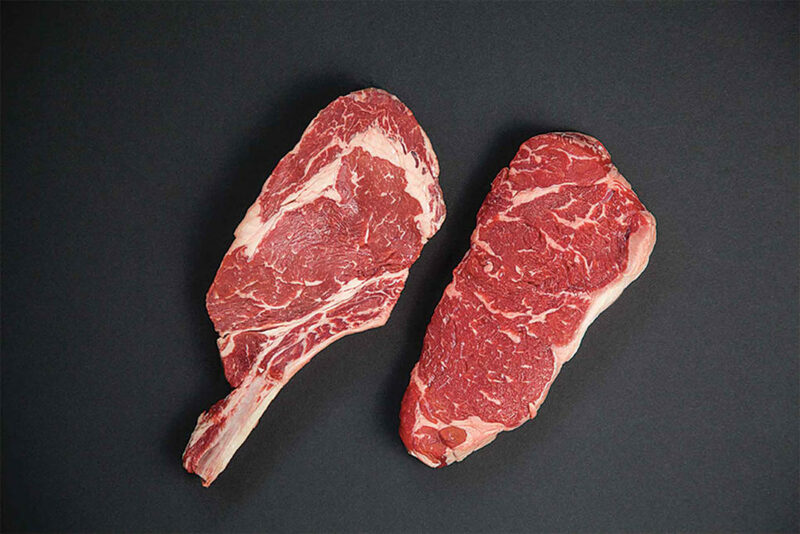 Grass fed beef can be well marbled, as both of these cuts show. Cattle finished on grass stay in the producer’s hands until just before reaching consumers, and that can be a marketing advantage. “Consumers are more aware of where their food is coming from,” says Rowntree. “They want to know how it’s raised.” And, he says, they want to personally know the farmer. Many of John Wood’s customers are into the meat-based paleo diet. One of his customers is the New York Jets football team. They put his product on the training table every week. Now, all of his cropland is in forages. And he’s working with his neighbors to plant cover crops after they harvest their wheat. 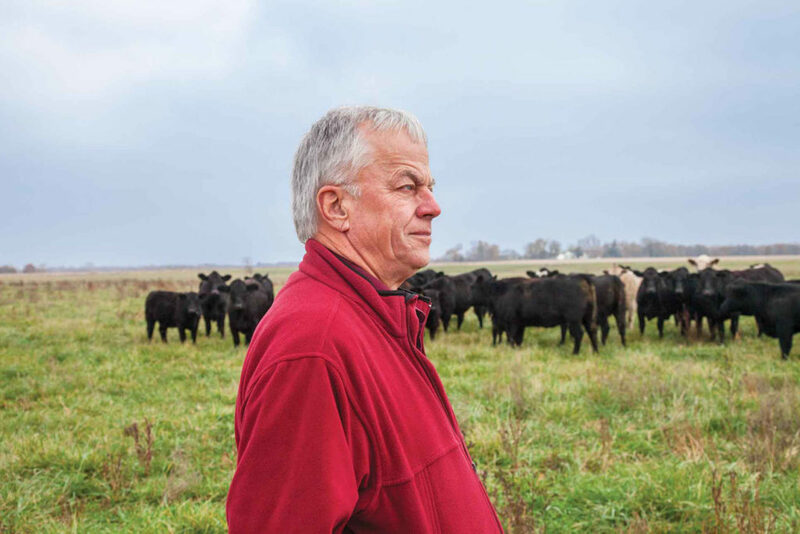 It’s an even swap—he gets the forages, they get the soil health benefits from his cover crops. Nelson sells in a variety of ways, but mostly it’s direct-to-consumer. He’ll sell anything from a pound of hamburger to a whole or half side of beef, and his pricing is 20 to 25 percent above commodity beef. He agrees that managing forages and how cattle feed on those forages is critical, not only to how meat tastes but also to how quickly he can move cattle to slaughter. His pastures—with wide variety of forages, such as fescue, red clover, brassicas, oats, and many others—are divided in paddocks. Cows with calves might be given pretty large paddocks. Ten cattle about to be harvested might feed on a half acre of very lush forages. High forage value covers make more of grazing acres. Farmers get the numbers on healthier soils.